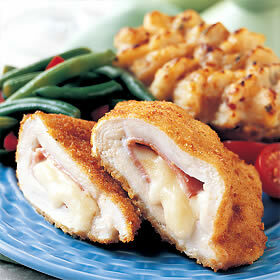 Chicken Cordon Bleu with seasoning sauce. Combine ham, cheese, garlic, wine, salt and pepper in a bowl to make a filling. Bake at 350F for 45 minutes or until done. Serve with pasta and zucchini.